News of President Trump’s alleged deal with the Democrats on DACA and the border wall sent shockwaves throughout the media Wednesday evening. 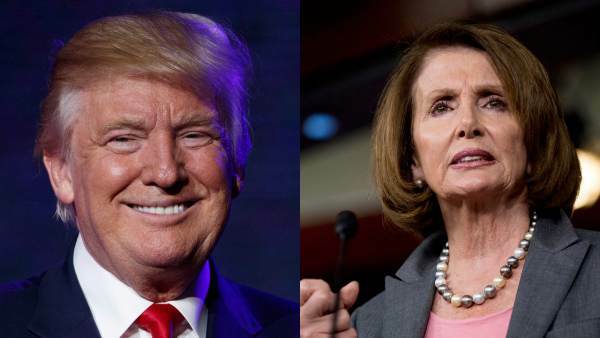 While it’s being widely reported President Trump and Democrat leaders Nancy Pelosi and Chuck Schumer struck a deal, or agreed to work on a deal, the White House’s legislative affairs director Marc Short says not so fast. “WH leg affairs director Marc Short calls Dems’ DACA statement “misleading,” says no deal on DACA or border wall $$ was reached tonight,” tweeted Ballhaus. The Trump administration may very well demand border wall funding be included in a deal with DACA, as TGP reported last night, Speaker Ryan believes support for it is slim to none. At a private dinner over the summer, Speaker Paul Ryan claimed Congressional support for a border wall between the U.S. and Mexico is non-existent. Only “one member” supports President Trump’s core campaign promise to build “the wall,” said Ryan. House Speaker Paul Ryan, at a private dinner earlier this year, said he thought only “one member” wanted to build a wall across the entire U.S.-Mexico border, Breitbart News has learned from multiple sources with direct knowledge of the comments, including former Rep. Tom Tancredo (R-CO). The dinner, sources said, took place on the eve of the House’s passage of two relatively minor immigration bills at the end of June: Kate’s Law and sanctuary city reforms. The far wider reaching Davis-Oliver Act was tabled at the same time. “Ryan told a group of Republicans he met with … that only one person wants a wall,” Tancredo told Breitbart News shortly after the dinner. 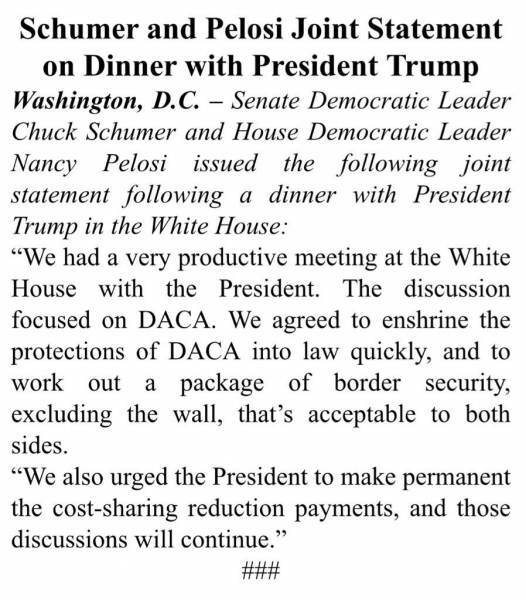 Here is the joint statement from Schumer and Pelosi on their dinner with President Trump. The top House and Senate Democrats said Wednesday they had reached agreement with President Donald Trump to protect thousands of younger immigrants from deportation and fund some border security enhancements — not including Trump’s long-sought border wall. The agreement, the latest instance of Trump ditching his own party to make common cause with the opposition, was announced by Senate Democratic Leader Chuck Schumer and House Democratic Leader Nancy Pelosi following a White House dinner that Republican lawmakers weren’t invited to attend. It would enshrine protections for the nearly 800,000 immigrants brought illegally to this country as kids who had benefited from former President Barack Obama’s Deferred Action for Childhood Arrivals, or DACA, program, which provided temporary work permits and shielded recipients from deportation. […] “We agreed to enshrine the protections of DACA into law quickly, and to work out a package of border security, excluding the wall, that’s acceptable to both sides,” Pelosi and Schumer said in a joint statement. Marc Short is not our friend. He is a NeverTrumper and a former Koch associate. He made the stupid statement that DACA and taxes could be tied together but no wall funding connection. On Thursday evening, Lou Dobbs gave it to Louie Gohmert on the no wall talk and Marc Short. I believe the democrats on this, especially after Sarah Huckabee Sanders said the President wanted "comprehensive immigration reform." Last edited by GeorgiaPeach; 09-14-2017 at 12:42 AM. I doubt that Trump actually has the political skills to make a such deal--done over dinner---work. This is not real estate. He represents ideals, no question there. But the inside mechanisms of Washington are not going to take place over some informal dinner. Well, maybe they will, but Trump is not really in the loop of backroom deals. And that's what we want: Drain the Swamp. You need to watch that press conference, GeorgiaPeach, September 12, 2017, she never said that. I posted the video of the whole WH presa conference on one of the threads for everyone to watch. She said President has always wanted "responsible immigration reform". Then she was asked basically the same question again by another reporter and was describing it and used the term "comprehensive immigration reform" because she was describing all the things that Trump wants to tackle to improve our system in a comprehensive way. John Roberts of Fox New asked her about the discrepancy of "responsible immigration reform" versus "comprehensive immigration reform" which is amnesty, and she said "responsible immigration reform" again to clarify what was an innocent misspeak. 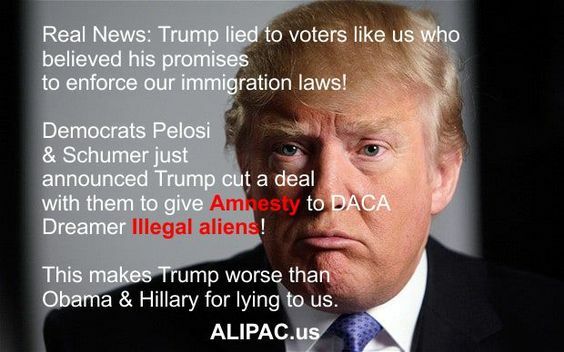 Of course the crooked corrupt media ran the headline as White House Says Trump Has Always Supported Amnesty. Last edited by Judy; 09-14-2017 at 12:59 AM. Judy, Trump said he supported Comprehensive immigration reform on July 13 of this year and we all know that means Amnesty for illegal aliens. Trump said he wants Congress to pass a bill for DACA illegals and we all know that means Amnesty. He said he supports the Dreamers..loves them.. .has a big heart for them. Trump broke his promises to us to end DACA! Now Trump team wants to call it "responsible immigration reform" and we know that immigration reform means AMNESTY! Everyone reading this please take note. I DO NOT WANT TO SEE ANYONE ON OUR WEBSITE TAKING UP FOR OR DEFENDING DONALD J TRUMP AFTER THIS! WHAT HE IS DOING IS UNFORGIVABLE AND I WANT ANY AND ALL SUPPORT AND DEFENSE OF HIM TO END RIGHT HERE AND NOW. I FEEL VERY BETRAYED AND HAVE A HIGH DEGREE OF CONTEMPT FOR TRUMP AND WANT EVERY RESOURCE I HAVE FOCUSED ON STOPPING HIS AMNESTY CON JOB FROM WRECKING AMERICA FOR GOOD! SO IF ANYONE WANTS TO TAKE UP FOR TRUMP OR SUPPORT HIM PAST THIS POINT... FIND SOMEWHERE ELSE TO DO THAT. Judy, do not use ALIPAC.us to defend or make excuses for Trump anymore. I will watch it Judy. Judy, GeorgiaPeach, MW and 1 others like this. Trump cuts deal with Democrats on DACA Amnesty for illegal aliens!